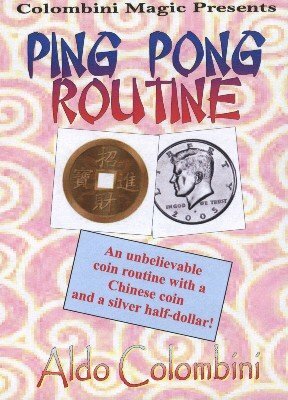 A great routine with coins in different phases. The performer holding a Chinese coin and a silver one separately in each hand, joins them together in one hand. The Chinese coin is then placed in a small box whilst the silver coin remains in the hand holding a chopstick. The Chinese coin, as by magic, leaves the box and becomes impaled on the stick, while the silver coin is found in the box. The Chinese coin penetrates the stick, while each end is held by a spectator, and becomes free. Both the coins held again in the hand change places, penetrating the fold of a handkerchief. The routine is clean and results in the coins, box and handkerchief being, if necessary, found to be free of deception. It requires a Chinatown Half.